Sicily is a fascinating land, rich in history and culture which can be discovered in a few days, travelling all over the island from the coasts to the hinterland, museums and parks, sea and mountains. Touring Eastern Sicily means immersing yourself in enchanting and mysterious places, among the memories of the ancient Greeks and the slopes of the Mount Etna between Messina, Taormina, Catania and Syracuse. If you’re looking for two or more ideas to visit this beautiful side of Sicily even just for a weekend, here you’ll find some tips to live a brief, unforgettable holiday in east Sicily. And what’s the best way to enjoy a journey full of fun and relax? Don’t overthink about it and take a look at our selection of Sicily Villas with Pool! Our tour start with Messina, one of the most important ports in Italy. Our first advice is to reach the byzantine Cathedral of Santa Maria Assunta, which preserves an beautiful collection of art masterpieces, the Orione fountain, viale San Martino and the Church of Catalani. We suggest you to explore the city and to get lost in its liberty allure among beautiful architecture and historic buildings or on the trail of Antonello da Messina and its famous Annunciation. 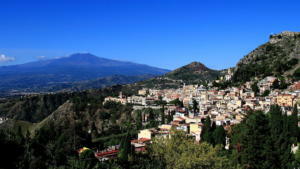 What to see in near villas in Taormina in one day? Well, if you have time and you want to relax it is worth spending a few hours on the beach of Isola Bella and then take a walk along the main street where there are both the ancient Taormina Theater and lively shops and clubs. Once you get to Catania, you can surely stroll around and discover the most famous landmarks such as “u Liotru” (the elephant, symbol of the city) which opens the door to an exciting visit inside the old centre. Don’t forget Via Crociferi which is a real gem, and a of course an intense shopping session in via Etnea! For adventure lovers we recommend a tour of the Etna Park: you can climb – for those who are trained – and you can even venture into its internal tunnels. Another enchanting and famous city of south eastern Sicily is Syracuse: the city preserves the temple of Apollo, the fountain of Diana, the source Aretusa, the castle Maniace, the Jewish Bath, and of course the theater Grego and the amazing Ortigia.